Gloria Sports Arena, which opened in January 2015, is part of the Gloria Hotels & Resorts Group whose hotels are located adjacent to the coast, just outside Belek in southern Turkey, approximately 42km east of Antalya. The sports complex is a modern, multisports training venue covering indoor, outdoor, aquatic, sports medicine & athletic performance centre and accommodation. Although the sports complex is relatively new, they have attracted national teams from Germany, Belgium and Ukraine across a range of sports. Gloria Sports Arena is also host to the Gloria Ironman 70.3 Turkey. By Air: Antalya airport (AYT) 34km from the resort. Transfers: From (and return) the airport can be arranged and may be subject to a charge. 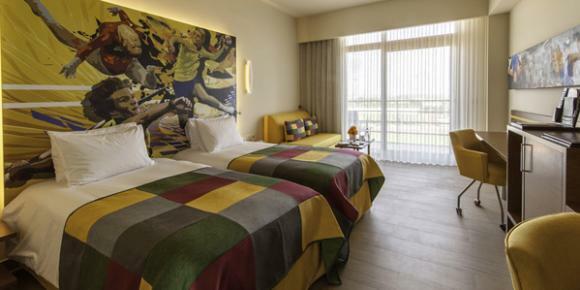 The Gloria Sport Arena has 100 rooms, all with views over the adjacent stadium. They come with a balcony or terrace, WiFi access, Satellite TV, interactive system and LCD TV. The hotel's restaurant (Elly's Restaurant) offers an international range of cuisine and also offers a Sports food option, more suited to high performance athletes. 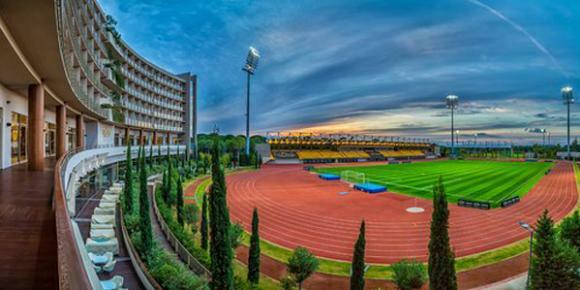 Discover the full extent of Gloria Sports Arena's sporting facilities for your training camp. Football: 4 pitches to FIFA standards. Athletics: IAAF approved athletic fields and equipment for all track & field. Hockey: 1 synthetic grass hockey pitch to FIH standard. Pool 1: Outdoor 10 lane Olympic swimming pool built according to FINA standards. Pool 2: Indoor 5 lane swimming pool, 50m in length. Pool 3: Outdoor multipurpose pool for diving, water polo games and synchronized swimming. Sports Hall: Suitable for Basketball, Volleyball, Handball, Badminton and Table Tennis. Multi-Purpose Studio: Suitable for Weightlifting, Boxing and Martial Arts. The Centre offers: Medical Services, Physiotherapy & Rehabilitation Services, Complex Therapies, Performance Diagnostics and Training Services. Comments: The most amazing place to do sport in an perfect environment!! Comments: It's by far the best sport centre in the world!! The facilities are incredible but also the service is absolutely amazing!! Comments: Sports Training showcasing state of the art sports technology and facilities! Comments: Sensational! For Athletes A Paradise! Super friendly and always helpful staff in all areas!